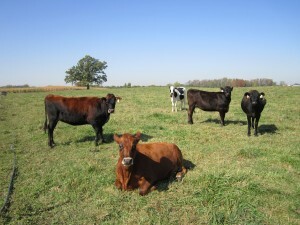 Our steers in their natural element: the pasture! As we become increasingly conscious consumers, we want to know from where our food comes and how it is produced. Here at Saxon Homestead Farm, we believe in environmental sustainability and humane treatment of livestock. We take great pride in raising high-quality Grass-fed Finished beef steers. We “finish” our steers in summer and fall on a salad bar mixture of pasture grasses and legumes. No grain is fed to our steers once they reach their first birthday. We do not use growth hormones and do not feed any weight-gain antibiotics. If you are interested in purchasing our beef, click here for meat quantity and pricing information. For availability and butcher scheduling information, please contact Karl Klessig at (920) 693-3360 or saxon1@tds.net or Robert Klessig at (920) 377-0914 or rklessig@tds.net. Or, fill out the form below, and we will reply soon!